Patches on left contributed by Mike Smolinski, on right by Lester Palifka. 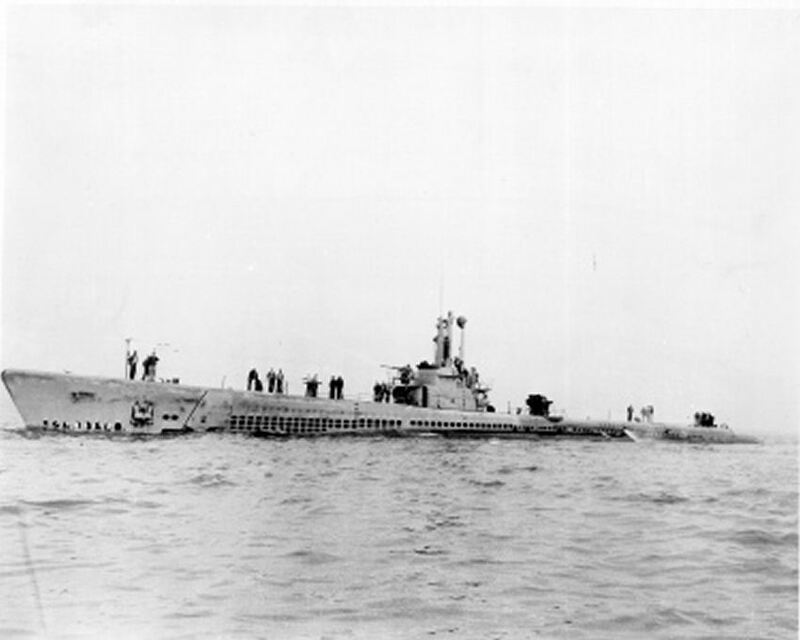 Balao Class Submarine: Laid down, 15 March 1943, at Portsmouth Navy Yard, Portsmouth, NH; Launched, 12 July 1943; Commissioned USS Pampanito (SS-383), 6 November 1943; Decommissioned 15 December 1945; Laid up in the Pacific Reserve Fleet; Reactivated and place in service as a Naval Reserve Training Ship in April 1960, assigned to the Mare Island Naval Reserve Training Center; Reclassified Auxiliary Submarine (AGSS-383), 6 November 1962; Struck from the Naval Register, 20 December 1971; Final Disposition, on permanent display at the San Francisco Maritime Museum. 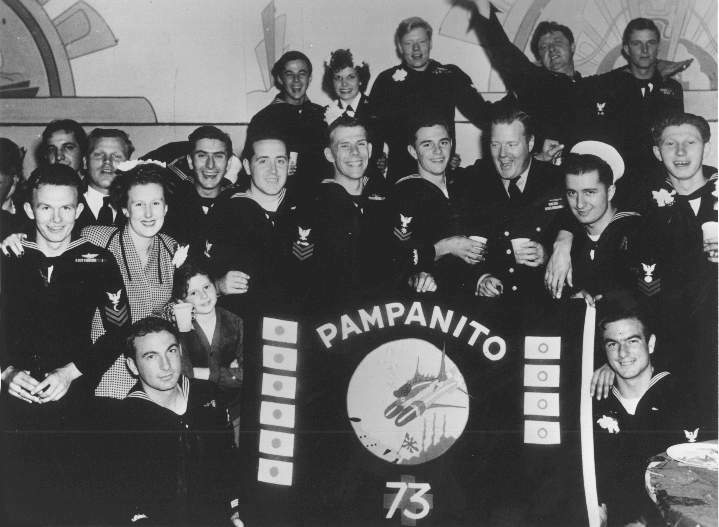 Pampanito received six battle stars for World War II service. 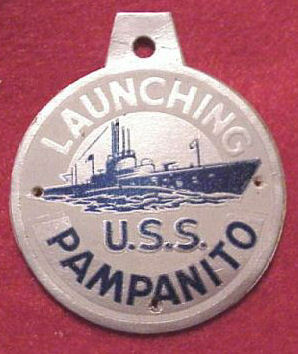 27k Commemorative medallion on the occasion of the launching of the Pampanito (SS-383) on 12 July 1943. Photo courtesy of Jack Treutle (of blessed memory). 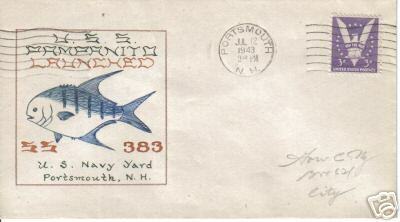 16k Commemorative postmark issued on the occasion of the launching of the Pampanito (SS-383) on 12 July 1943. Photo courtesy of Jack Treutle (of blessed memory). 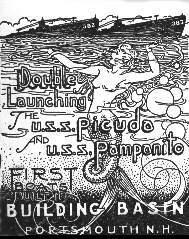 19k Pampanito (SS-383), commemorative launching card at Portsmouth Navy Yard, Portsmouth, NH. 1943. Courtesy of Lester Palifka. 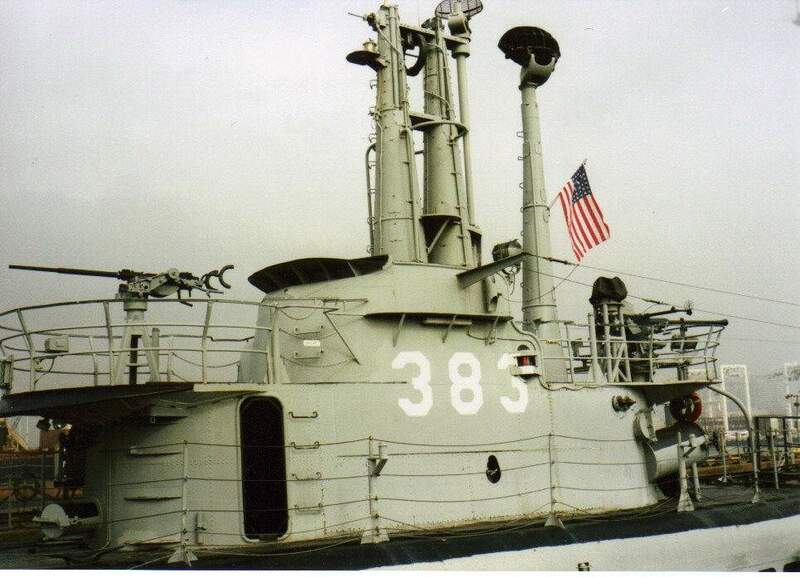 56k Pampanito (SS-383), commissioning crew photo. Courtesy of Lester Palifka. 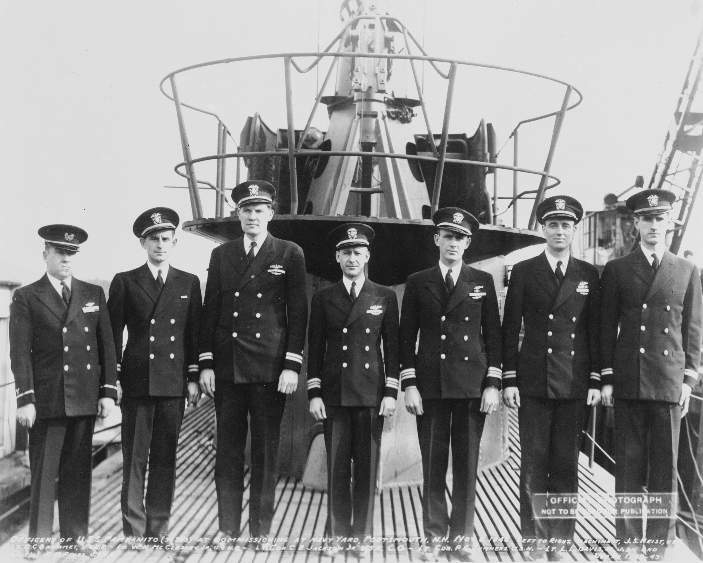 52k Pampanito (SS-383), ship's officers, commissioning 1943. Courtesy of Lester Palifka. 52k Pampanito (SS-383), port side view underway, 1944. Courtesy of Lester Palifka. 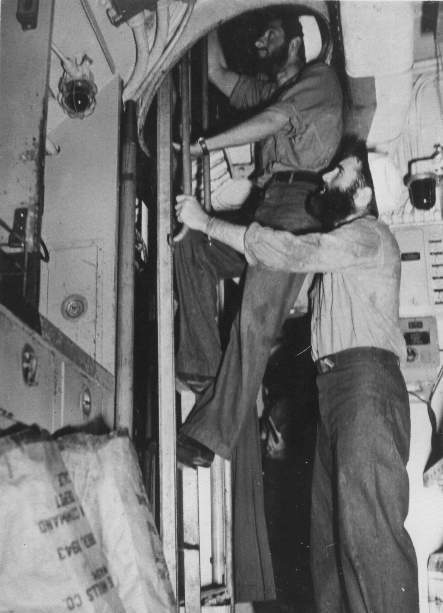 33k Pampanito (SS-383), ship's crew in the galley, circa 1943-45. Courtesy of Lester Palifka. 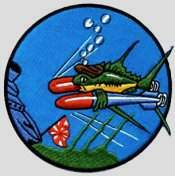 1.41k Pampanito's (SS-383) 3rd war patrol (17 August-28 September 1944), a "wolfpack" operation with submarines Growler (SS-215) and Sealion (SS-315), was conducted in the South China Sea. On 12 September, she sank 10,509-ton transport Kachidoki Maru and 5,135 ton tanker Zuiho Maru and damaged a 3rd ship. 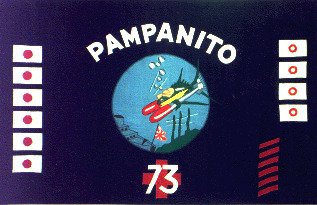 I. R. Lloyd print of the Pampanito (SS-383) in WW II. Text courtesy of DANFS. 37k Pampanito (SS-383) in July 1945 wearing Ms 32/3SS-B camouflage scheme. 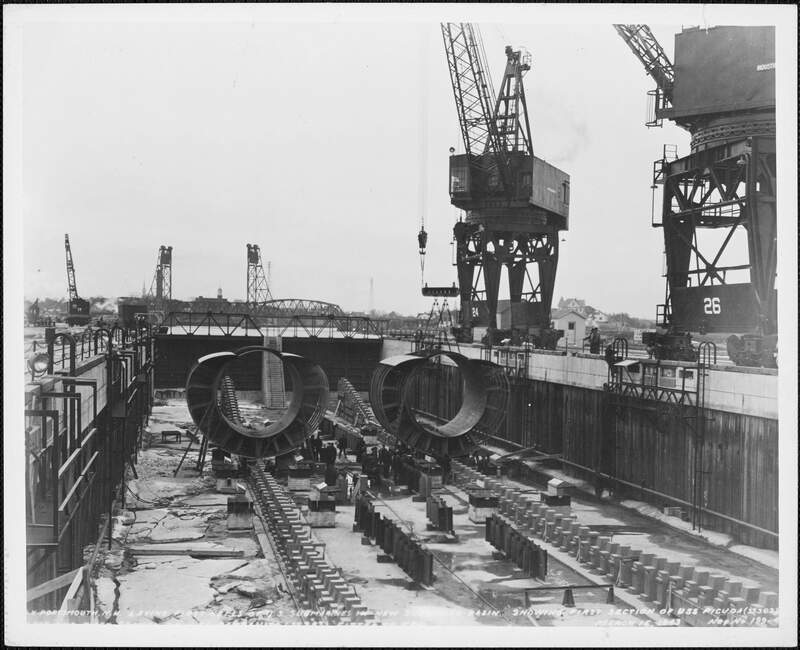 Courtesy of The Floating Drydock, "Fleet Subs of WW II" by Thomas F. Walkowiak. 72k Oil/alkyd on canvas by the artist John Meeks entitled "The Homecoming". 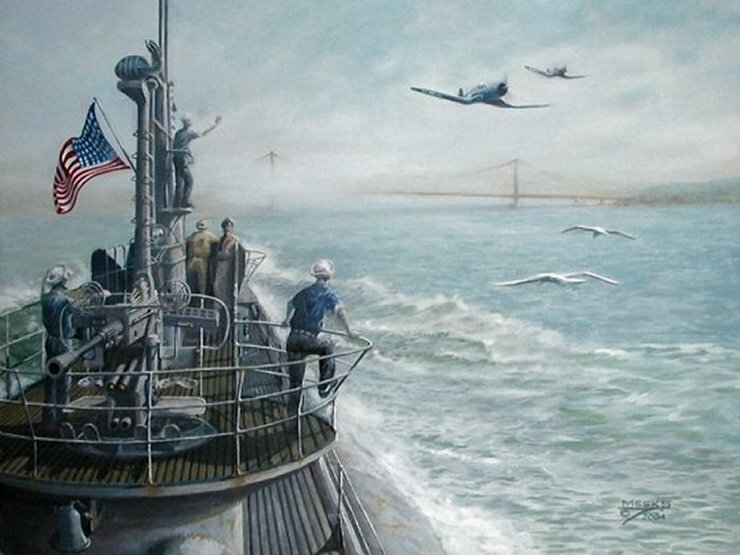 The sub - proudly escorted by a few seagulls, is greeted by a pair of Navy "Corsairs" roaring out over the now peaceful Pacific. In the background, the Golden Gate Bridge invitingly looms out of the (obligatory...) fog banks that constantly drift over the Northern Californian coast. Photo & text courtesy of subart.net. 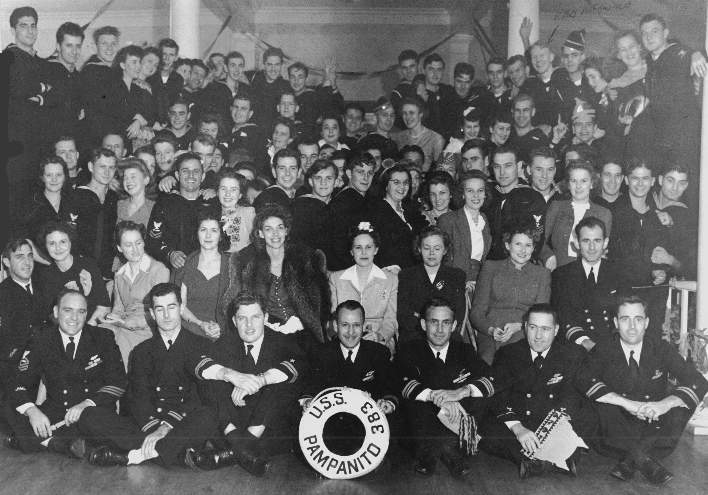 45k Pampanito (SS-383), decommissioning crew photo. Courtesy of Lester Palifka. 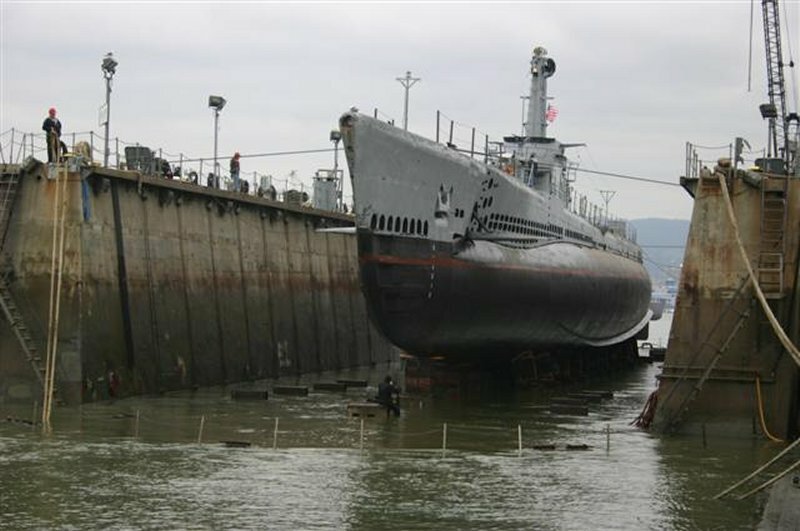 80k Gurnard (SS-254) in drydock, at Hunters Point with the Pampanito (SS-383) on her port side. The DE in background could be Creamer DE-308 which was built and launched at Mare Island but never completed. 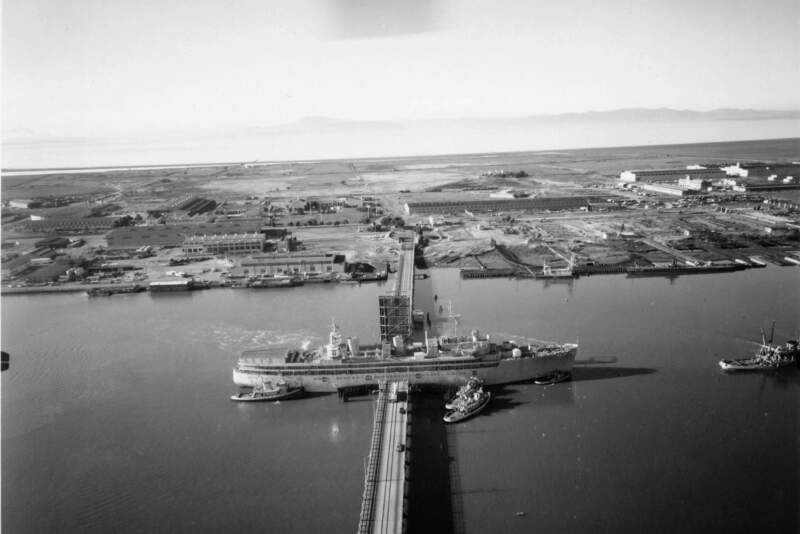 There were 3 Mare Island DE's not completed and two were cut in half and pulled onto the large building ways at the yard and scrapped. It makes sense that the third one could have gone to Hunters Point for its appointment with the cutting torch. 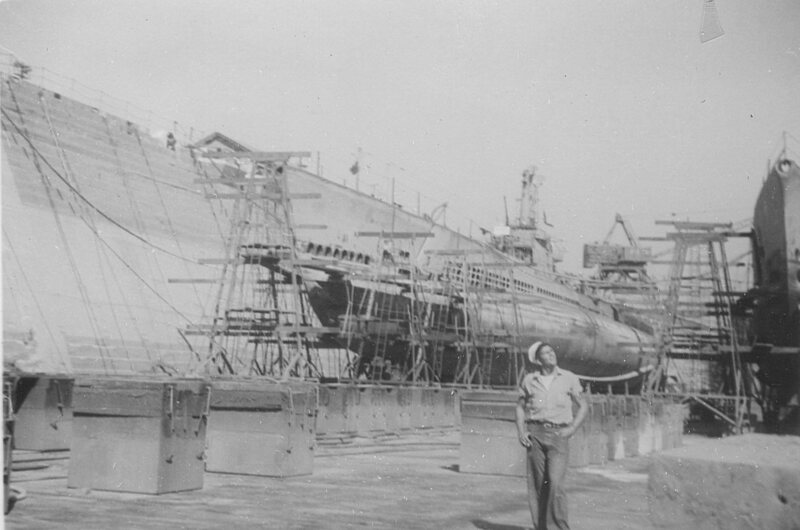 Gurnard came to Mare Island on 11/26/45 and was placed into Reserve on 11/27/45. Photo from the collection of CWO 4 Benton E. Buell, USN, courtesy of David Buell. Photo i.d. courtesy of Darryl L. Baker. 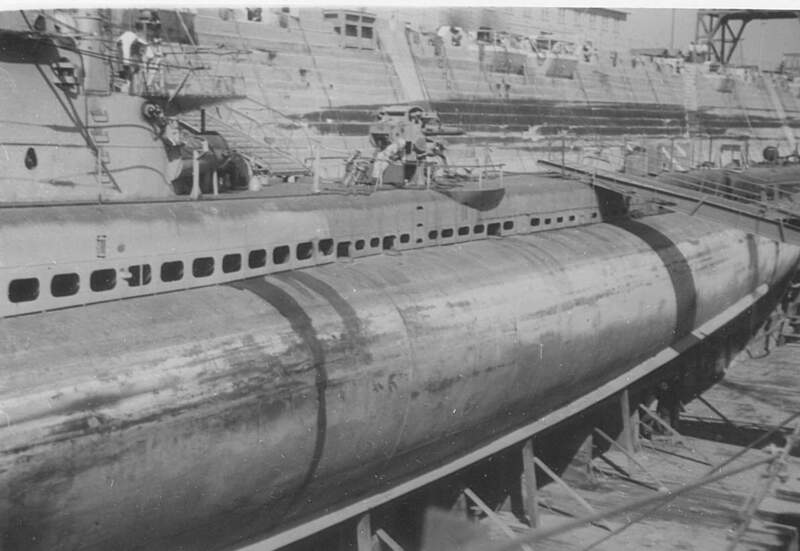 123k Gurnard (SS-254) in drydock with Pampanito (SS-383) as they are prepared for inactivation to the reserve fleet in October-November 1945. 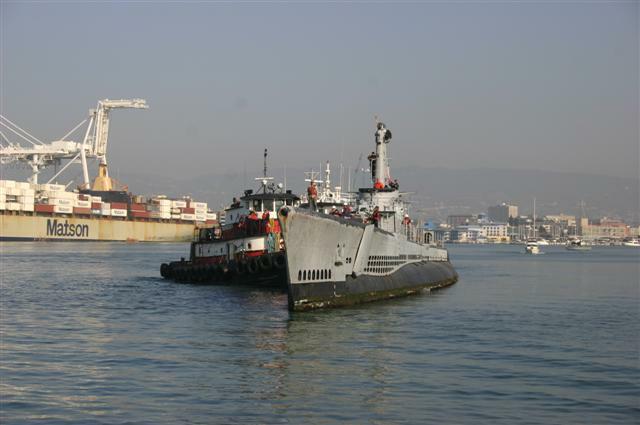 Pampanito was inactivated and decommissioned with Gurnard. Pampanito actually decommissioned after Gurnard, in early December 1945. The sailor in the photo is from Gurnard, TM2c Bill Parks. USN photo from the collection of CWO 4 Benton E. Buell, USN, courtesy of David Buell. 89k Pampanito (SS-383) taken in October-November 1945 time-frame when both Gurnard (SS-254) and Pampanito were undergoing inactivation procedures preparatory to decommissioning into the reserve fleet. USN photo from the collection of CWO 4 Benton E. Buell, USN, courtesy of David Buell. 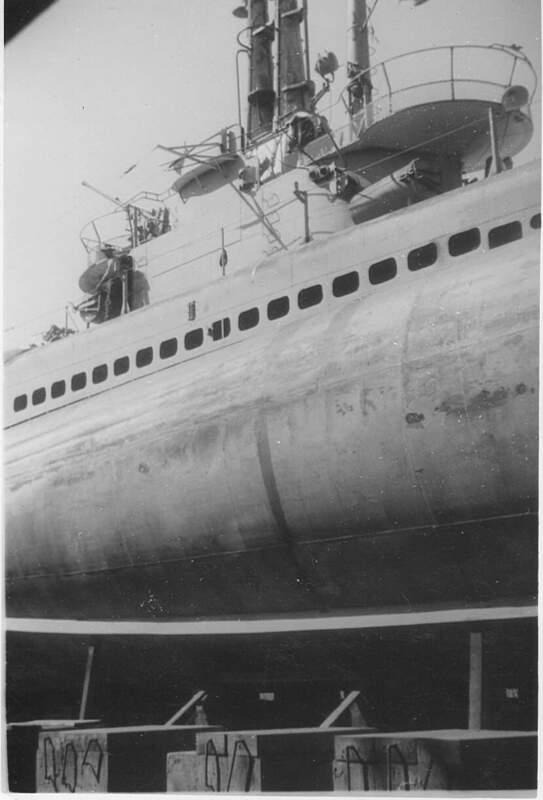 77k Pampanito (SS-383) taken from the floor of the drydock, late 1945. USN photo from the collection of CWO 4 Benton E. Buell, USN, courtesy of David Buell. 173k Pampanito (SS-383) after a Hunters Point refit, 23 July 1945, with a new SV air-search radar on her separate radar mast and new periscope shears with a DF loop between the periscopes and an SJ mast abaft them. The object forward of the bridge fairwater is a 20 mm mount. USN photo & text courtesy of U.S. Submarines Through 1945, An Illustrated Design History by Norman Friedman. Naval Institute Press & submitted by Robert Hurst. 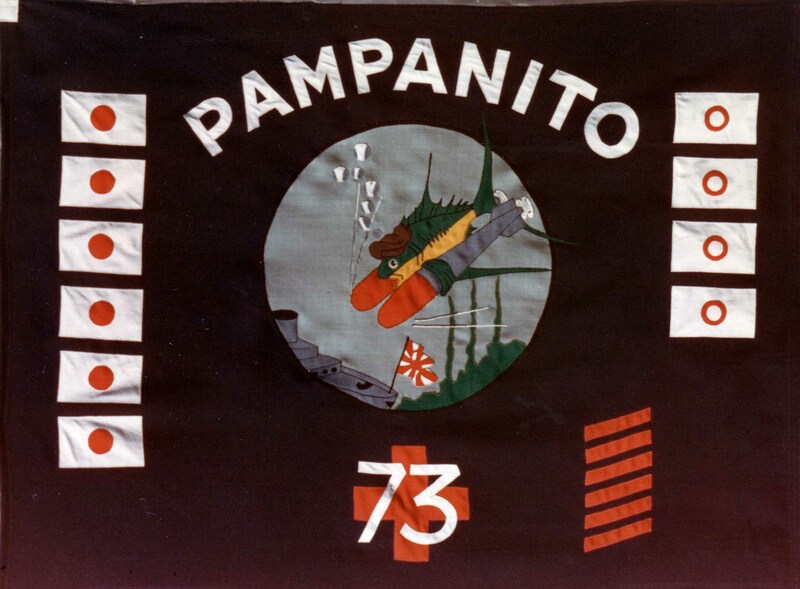 101k ex Pampanito's (SS-383) battleflag. Photo courtesy of Darryl L. Baker. 308k Bow view of the Tiru (SS-416) under construction at Mare Island on 3 January 1946. Submarines in the background are decommisioned or will soon be: from front to rear are Bashaw (SS-241), Pampanito (SS-383), Mingo (SS-261), Gurnard (SS-254), Macabi (SS-375), Tunny (SS-282), Guavina (SS-362) and Sand Lance (SS-381). USN photo # 18-46, courtesy of Darryl L. Baker. 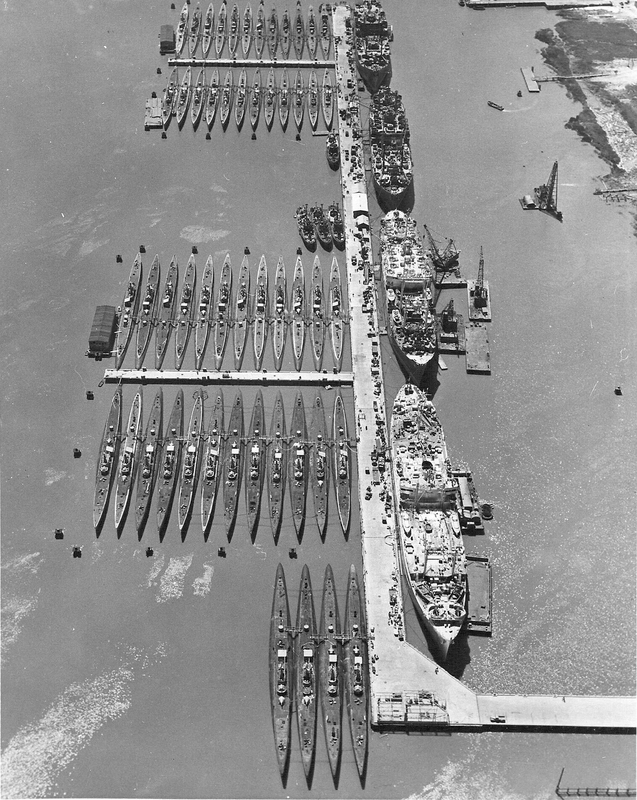 900k Inactivated submarines at Mare Island on 3 January 1946. 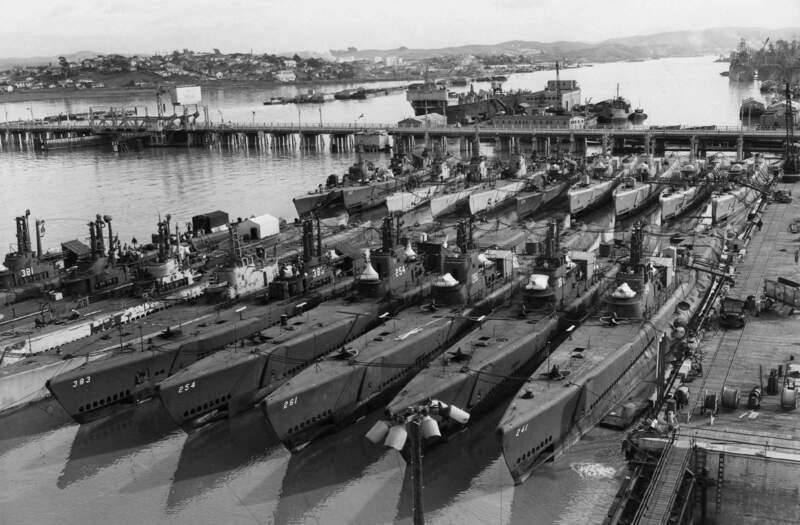 Front row left to right: Sand Lance (SS-381), next two could be Sealion (SS-315) and Seahorse (SS-304), Searaven (SS-196), Pampanito (SS-383), Gurnard (SS-254), Mingo (SS-261), Guitarro (SS-363), Bashaw (SS-241). Back row left to right: Unknown, Tunny (SS-282), next three could be Sargo (SS-188), Spearfish (SS-190), and Saury (SS-189), Macabi (SS-375), Sunfish (SS-281), Guavina (SS-362), Lionfish (SS-298), Piranha (SS-389). The Scabbardfish (SS-397) is docked in ARD-11 on the other side of the causeway. The mixture of boats from the Salmon/Sargo, Gato, and Balao classes illustrate the clear differences in the conning tower fairwaters and the periscope shears that can be used to identify boats. The high bridges with the uncovered support frames (the "covered wagon" look) of the Gato's and Salmon/Sargo's contrast with the low and sleek look of the Balao's. The fatter, more robust periscope shears of the Balao's are markedly different from the thinner shears with more supporting structure of the Gato's and Salmon/Sargo's. The differences in the pattern of the superstructure limber holes can also be used for identification purposes. The single row of large semi-circular holes identify Electric Boat or Manitowoc boats. A dual row of smaller rectangular holes mark the government built boats. Also note that the EB/Manitowoc boats have the deck mounted, T-shaped JP sonar head on the starboard side of the forward deck, while the government boats have it on the port side. EB/Manitowoc boats had the anchor on the starboard side, the government boats on the port side. A close look will show that some of the boats have had the anchor removed and the hawsepipe plated over as part of the mothball process. Most of the boats have the late war radar outfit of the SJ surface search (small dish) and SV air search (large dish). 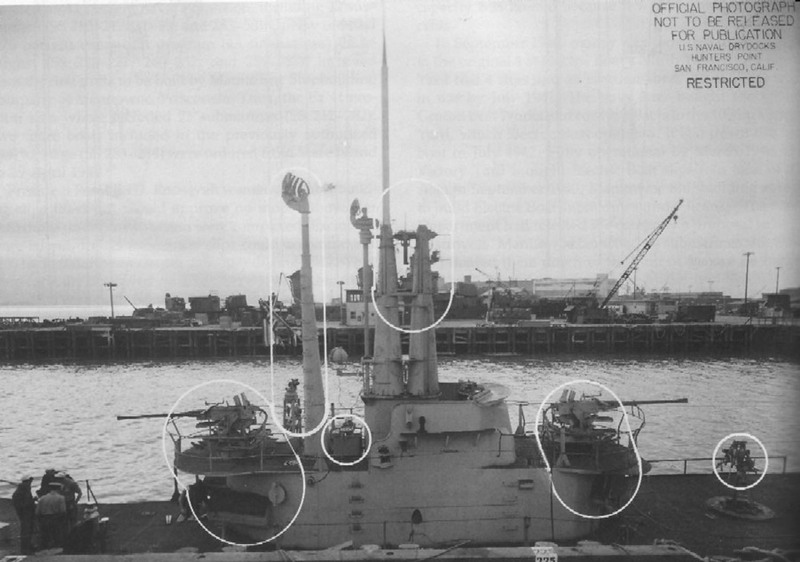 The Balao's and some of the Gato's have the SS dish mounted on a separate large mast aft of the periscopes. The older Salmon/Sargo's and Gato's have a much smaller mast. Searaven appears to have had her radars already removed. Searaven is actually sporting a late war SJ surface search antennae mounted to starboard of the periscopes. This is a rare installation. Most often it was mounted forward (early war) or aft (late war) of the 'scopes shears. Her air search set is a late war SD antennae mounted on a stub mast directly aft of the 'scopes. Searaven never received the much more capable SV air search set. Having been assigned to training duties after November, 1944 it was probably felt that the SV set was not necessary. One strange thing: almost all of the boats appear to have the outer doors of the forward torpedo tubes open. Even though the boats have an interlock system that prevents the breech and outer doors from being opened at the same time, this is an unusual thing to do and a potential source of catastrophic flooding. USN photo # 17-46, courtesy of Darryl L. Baker. 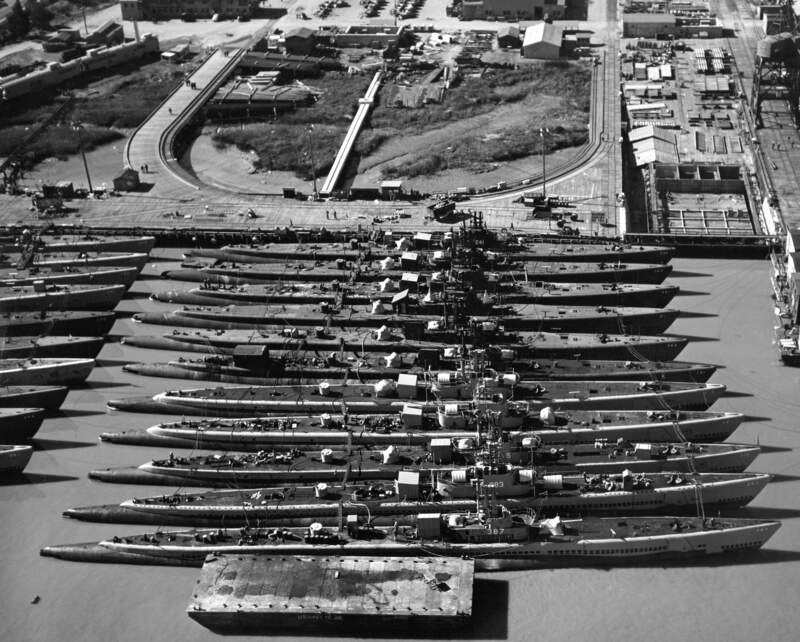 289k Inactivated submarines at Mare Island in early 1946. Tiru (SS-416) is on the ways in upper left hand side of photo. Two ferry boats (to the right of Tiru's ways) are YHB-2 / [ex-Post of Stockton] and YHB-21 / [ex-Tamalpais]. Photo i.d. courtesy of Darryl L. Baker. USN photo courtesy of Scott Koen & ussnewyork.com. 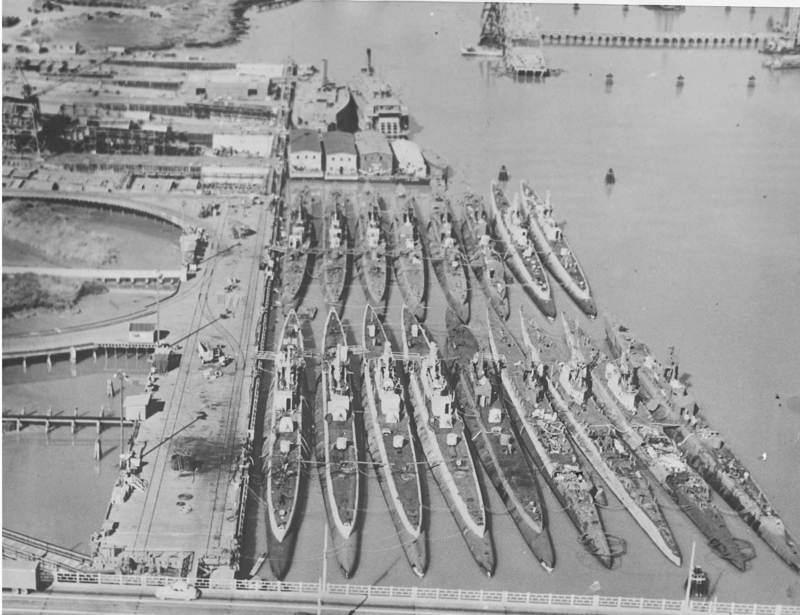 1.93k Aerial view of decommissioned submarine at Mare Island Reserve Fleet taken on 18 March 1946. The majority of the personnel topside are navy personnel. I would say they are still inactivating the subs. 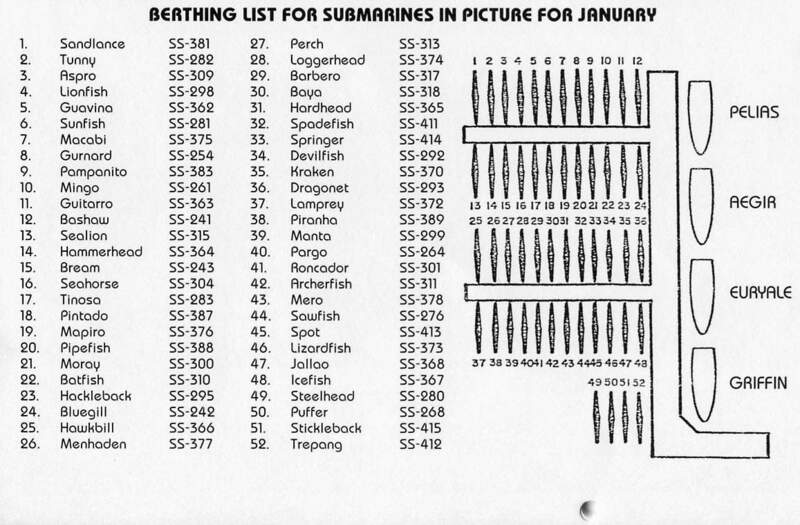 Submarines are from top to bottom: Bashaw (SS-241), Guitarro (SS-363), Mingo (SS-261), Gurnard (SS-254), Pampanito (SS-383), Sand Lance (SS-381), Bream (SS-243), Hammerhead (SS-364) Sealion (SS-315), Tinosa (SS-283) & Pintado (SS-387) plus YC 316. USN photo courtesy of the Vallejo Naval & Historical Museum via Darryl L. Baker. 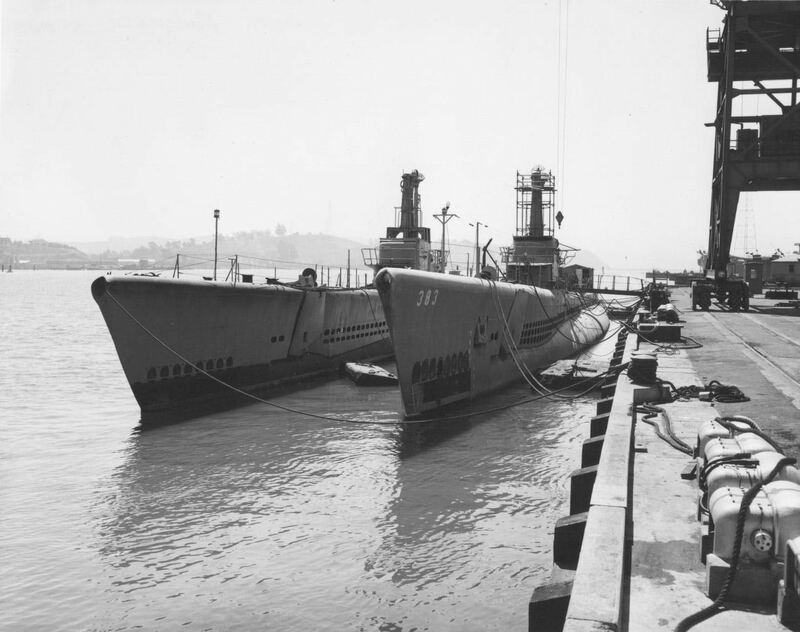 207k Sunfish (SS-281) & Pampanito (SS-383) along the water front at Mare Island in August 1960. Photo courtesy of Jim Richardson. 1.30k Pomfret (SS-391) off Mare Island on 23 August 1962. 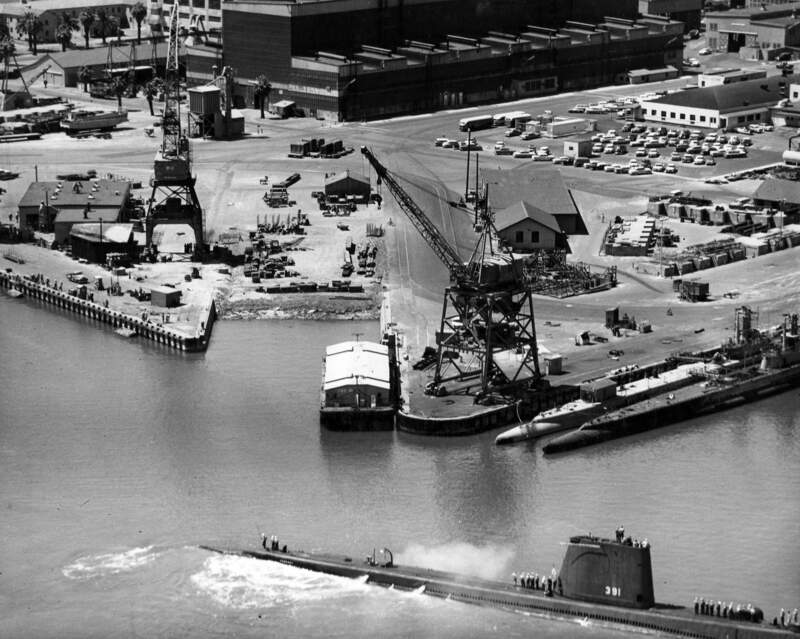 YRB-18 is in the background along with the sterns of two decommissioned submarines, the Pampanito (SS-383) inboard & Sunfish (SS-281), with her after deck being removed. Photo # 55846-8-62 TH from the collection of the Vallejo Naval and Historical Museum via Darryl L. Baker. Photo i.d. & text courtesy of Ric Hedman, Dave Johnston& Robert Morgan. 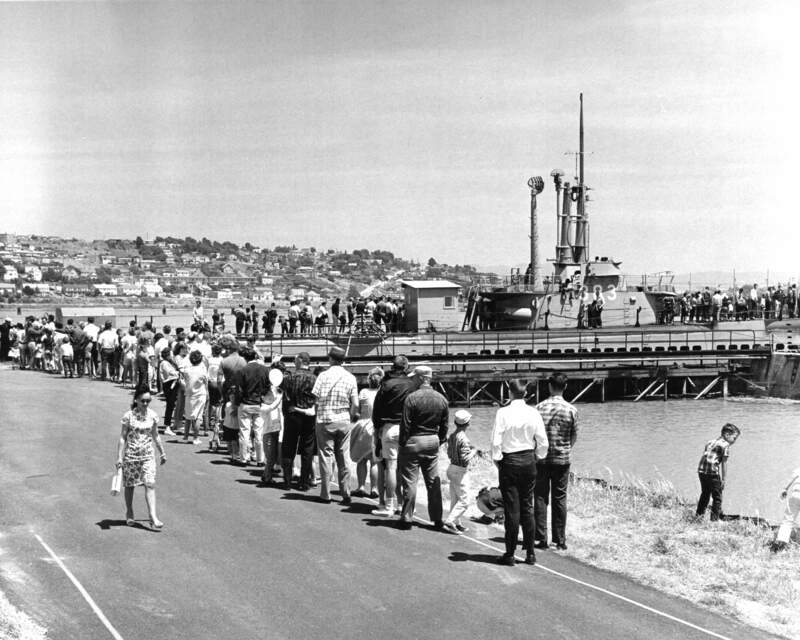 1.23k Crowd waiting to board the Naval Reserve Training submarine Pampanito (SS-383) at Mare Island during Armed Forces Day 15 May 1965. USN photo courtesy of the Vallejo Naval & Historical Museum via Darryl L. Baker. 145k Bow view of the Pampanito (SS-383) approximately 1970 at Mare Island. The boat to the left of the Pampanito is the Grayback (APSS-574). The boat to the right of the Pampanito is most likely Raton (SSR-270). Other ships identifiable in the background are the Canberra (CA-70), Litchfield County (LST-901), and Sedgwick County (LST-1123). Grayback had just finished conversion to APSS and the rest of the ships were mothballed. Text info courtesy of David Johnston. USN photo courtesy of ussubvetsofwwii.org. 268k The Nereus (AS-17) squeezing through the Mare Island causeway on her way to the Pacific Reserve Fleet on 11 December 1971. The Pampanito (SS-383) is the submarine in the photo to the right. The shipyard dredge is forward of the Pampanito. USN photo courtesy of Darryl L. Baker. 270k 5 page Welcome Aboard the Pampanito (SS-383) PDF. USN photos courtesy of Scott Koen & ussnewyork.com. 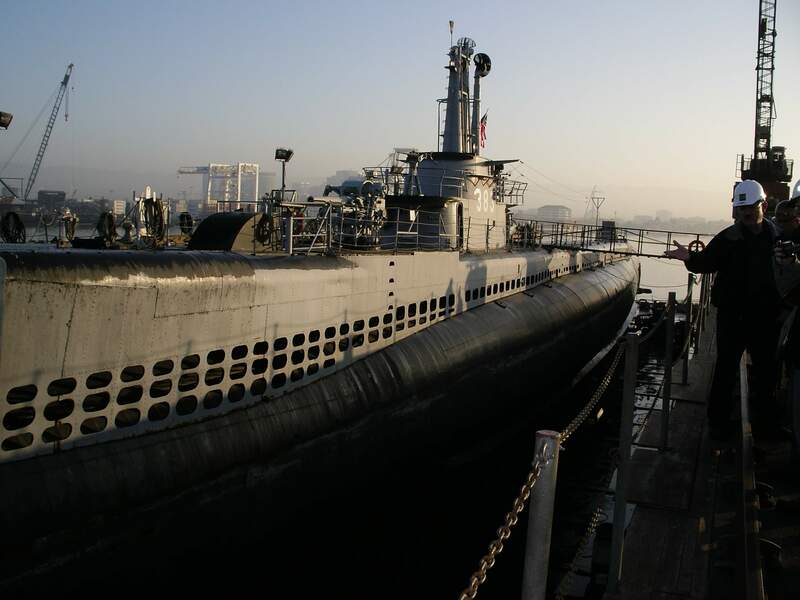 107k Pampanito (SS-383) was drydocked during her 1987 overhaul. Along with having many topside items restored and repaired she also got a fresh coat of bottom paint. Also, hull plates welded over openings were checked. Note the detail of the bilge keel and where the shaft penetrates the hull. This view is of the port side looking forward. 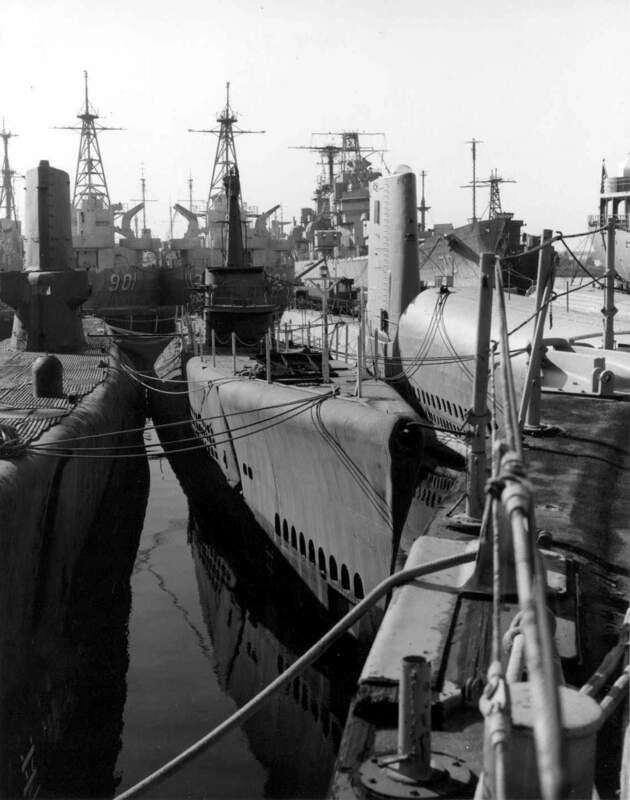 Courtesy of The Floating Drydock, "Fleet Subs of WW II" by Thomas F. Walkowiak. 97k Pampanito (SS-383) dockside in 1987. Photo from The World Encyclopedia of Submarines by John Parker courtesy of Robert Hurst. 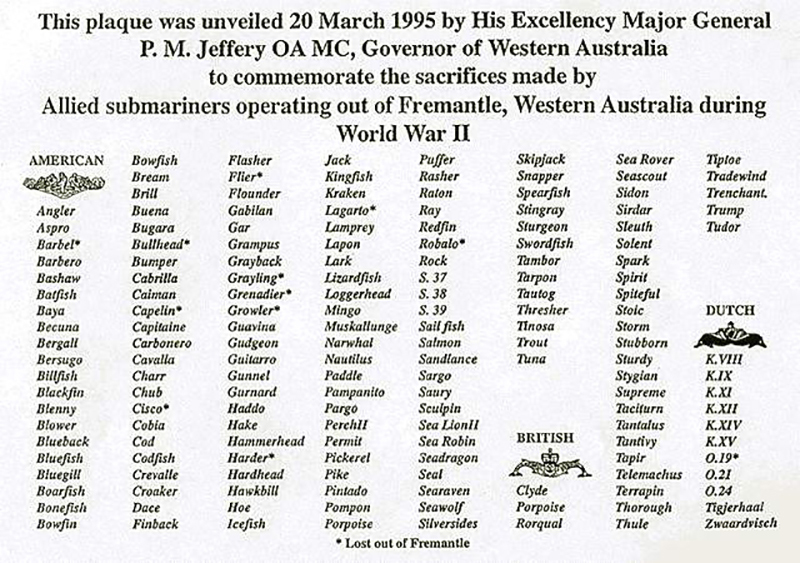 365k This plaque was unveiled 20 March 1995 by His Excellency Major General P.M. Jeffery OA MC, Governor of Western Australia to commemorate the sacrifices made by Allied submarines that operated out of Fremantle, Western Australia during WW II. Photo courtesy of Ron Reeves (of blessed memory). 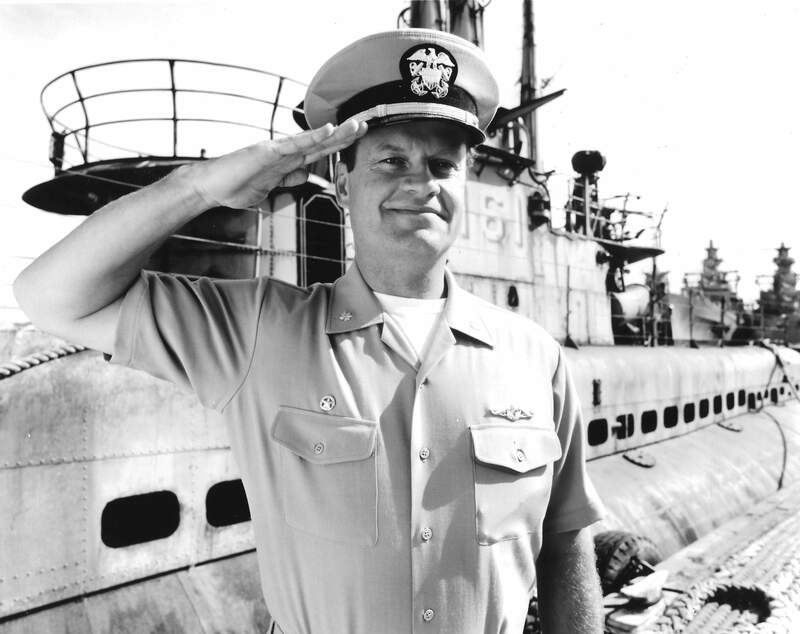 722k LCDR Tom Dodge (played by Kelsey Grammer) welcomes you to the Stingray (SS-161). "Down Periscope" began shooting on 6 May 1995 and finished on 27 July. 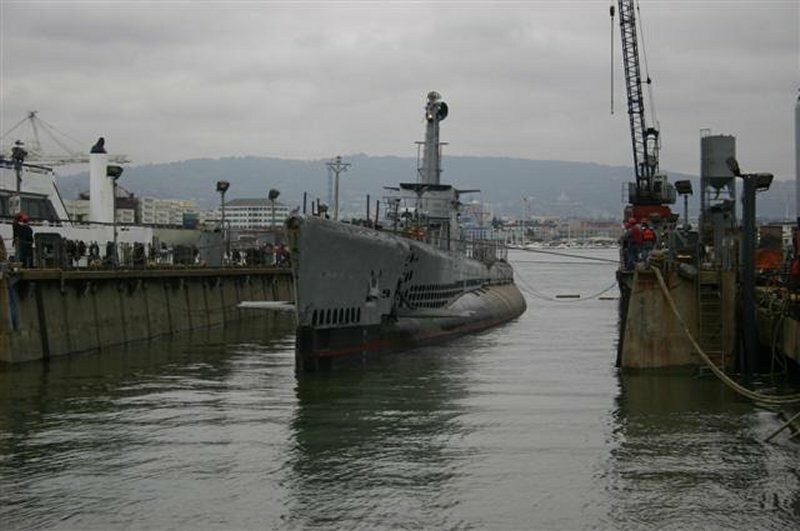 The Pampanito (SS-383), a Balao-class submarine from World War II, now a museum ship and memorial in San Francisco on display to the public at Pier 45 played the part of the Stingray. The Pampanito could not move under her own power. The underwater shots were scale models. 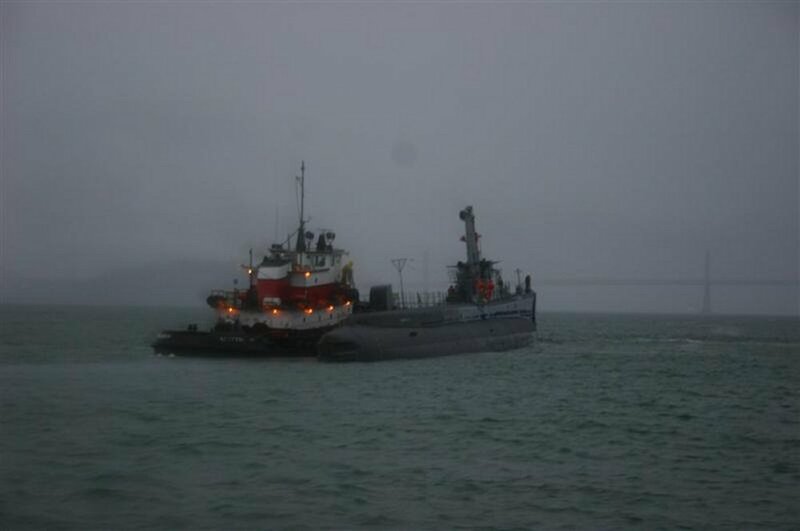 The surface shots actually were the Pampanito, however she was being towed. Photo courtesy of Bill Gonyo. 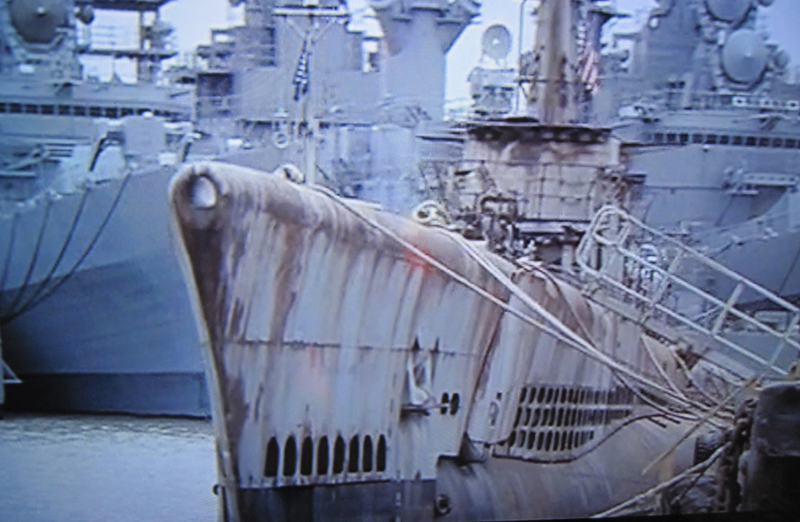 17k Pampanito (SS-383) appears here in the movie Down Periscope. 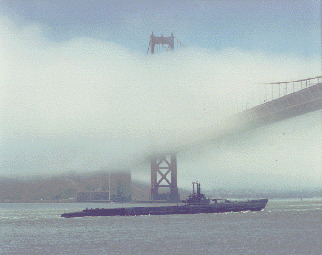 (1996) Photo by Robert Taylor, copyright by San Francisco Maritime National Park Association [SFMNPA]. Ms. Diane Cooper curator, Pampanito (SS-383) collection. 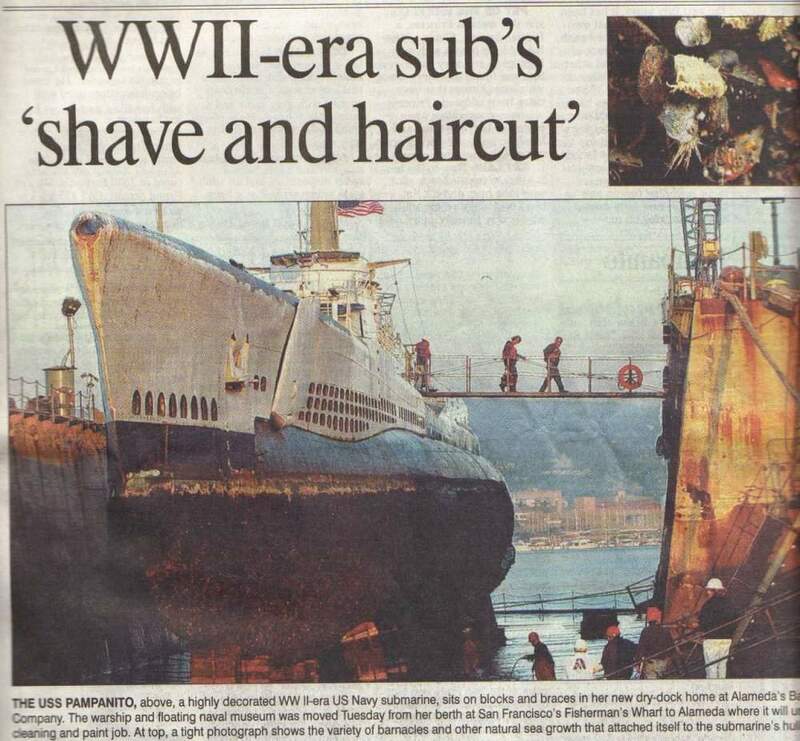 130k Alameda Journal, Volume 18, Number 107, Friday, January 2007 edition showing the Pampanito (SS-383) in drydock. Courtesy of Robert M. Cieri. 99k Pampanito's (SS-383) conning tower with 40mm & 20mm gun mount, 27 January 2007. Courtesy of Robert M. Cieri. 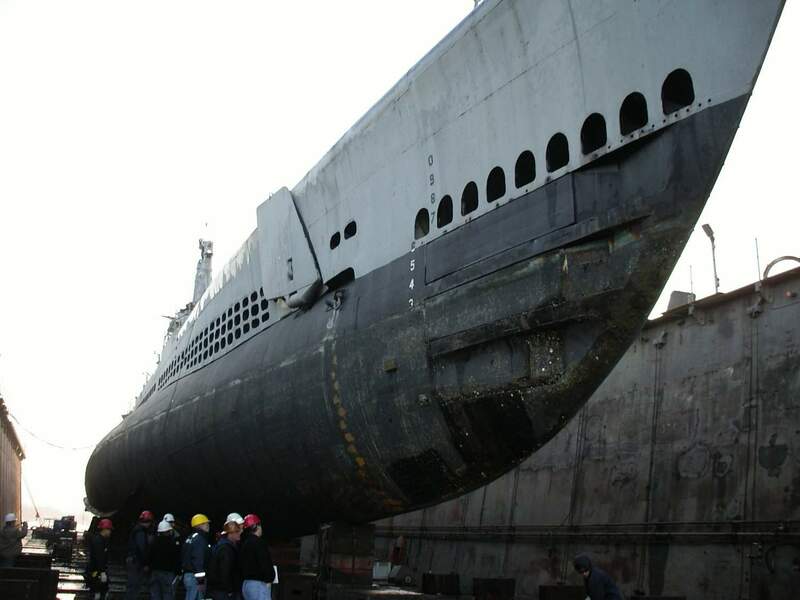 39k Pampanito (SS-383) starting to enter drydock for some much needed repairs, January 2007. Courtesy of Jack Treutle (of blessed memory). 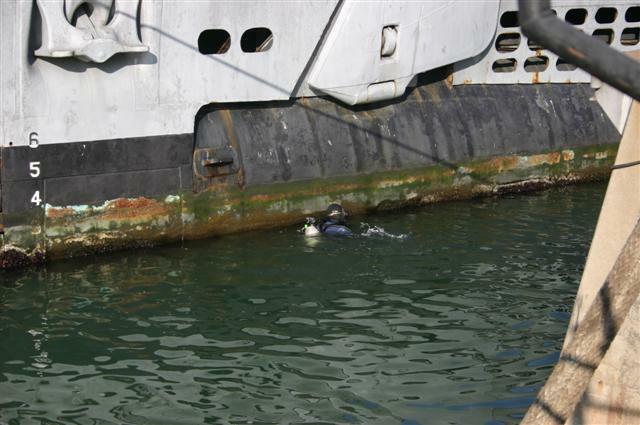 56k Diver inspecting the underside of the Pampanito (SS-383) in drydock, January 2007. Courtesy of Jack Treutle (of blessed memory). 100k Looking up from down under of the Pampanito (SS-383) while in drydock, January 2007. Courtesy of Jack Treutle (of blessed memory). 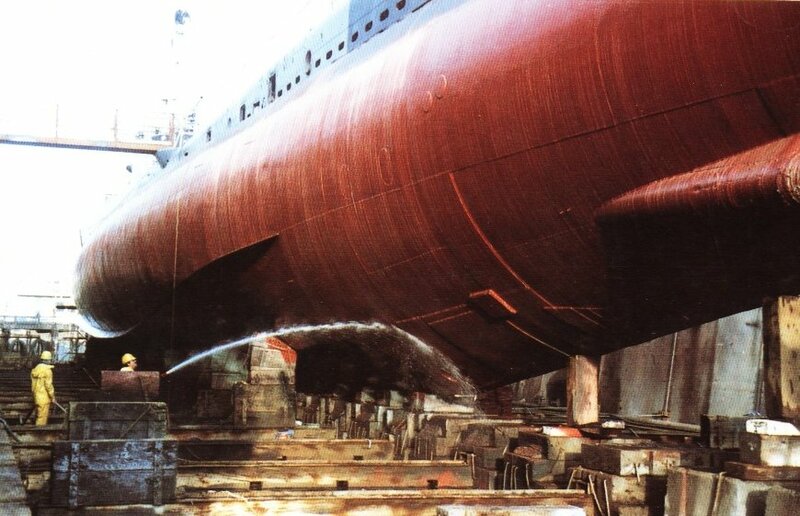 321k Portside bow view Pampanito (SS-383) in drydock, January 2007. Courtesy of Jack Treutle (of blessed memory). 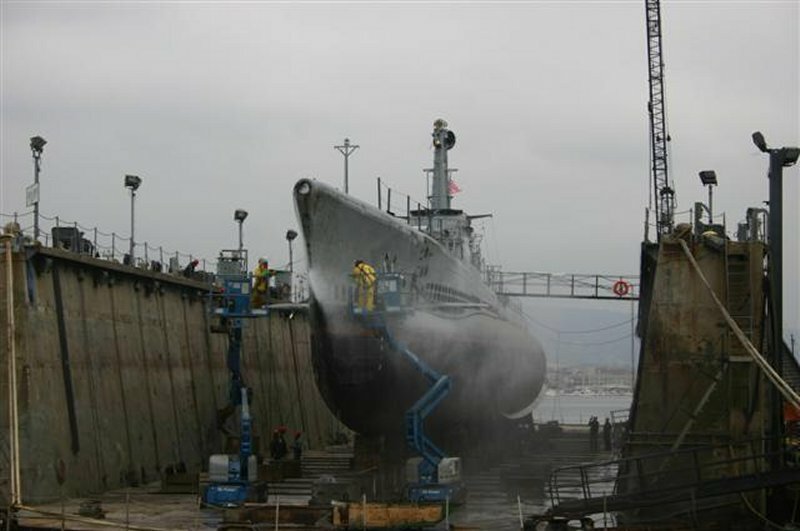 54k The Pampanito (SS-383) would receive two coats of gray epoxy and black anti-fouling while in drydock, January 2007. Courtesy of Jack Treutle (of blessed memory). 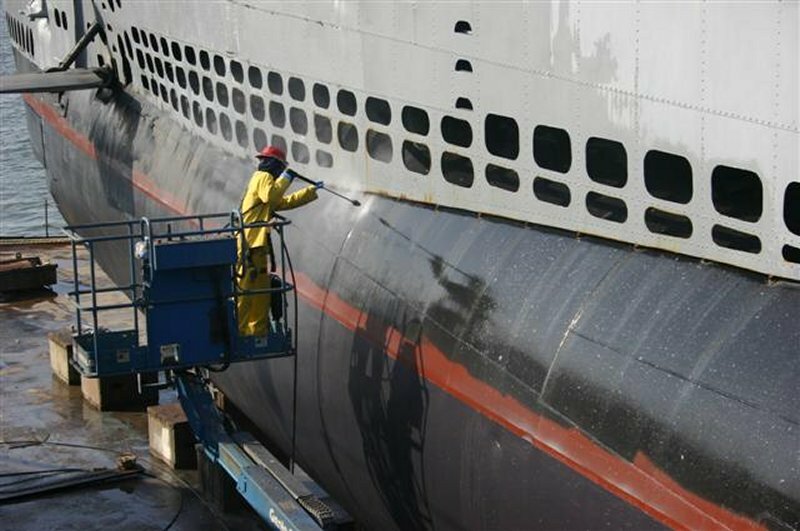 73k The Pampanito (SS-383) would receive two coats of gray epoxy and black anti-fouling while in drydock, January 2007. Courtesy of Jack Treutle (of blessed memory). 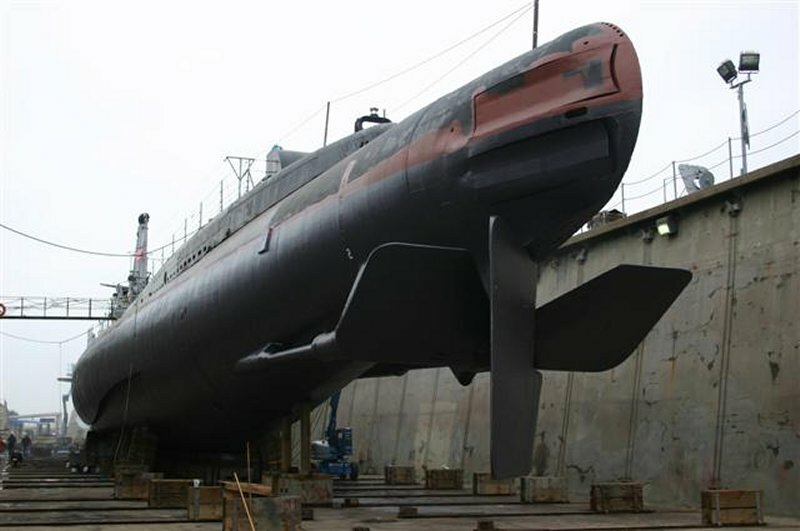 54k Stern view of the Pampanito (SS-383) while in drydock, January 2007. Courtesy of Jack Treutle (of blessed memory). 67k The Pampanito (SS-383) has her drydock flooded, or "fleeted", so the previously covered area of the boat which was resting on blocks while she was in drydock can be tended to; just barely floating the boat so they could move her aft about 3 feet then raise the drydock again so that they can get to the area where the blocks were and sandblast and paint it. Partial text and photo courtesy of Jack Treutle (of blessed memory). 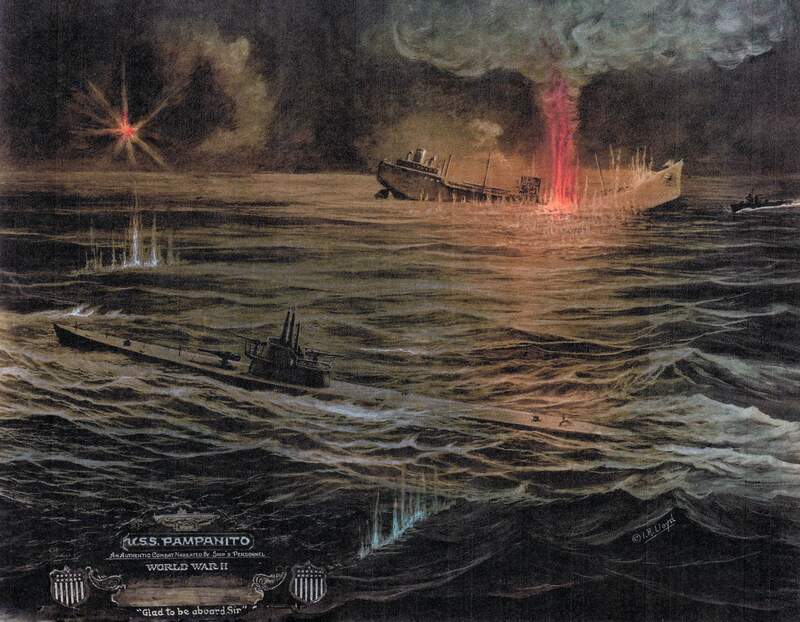 54k The Pampanito (SS-383) following "fleeting". Photo courtesy of Jack Treutle (of blessed memory). 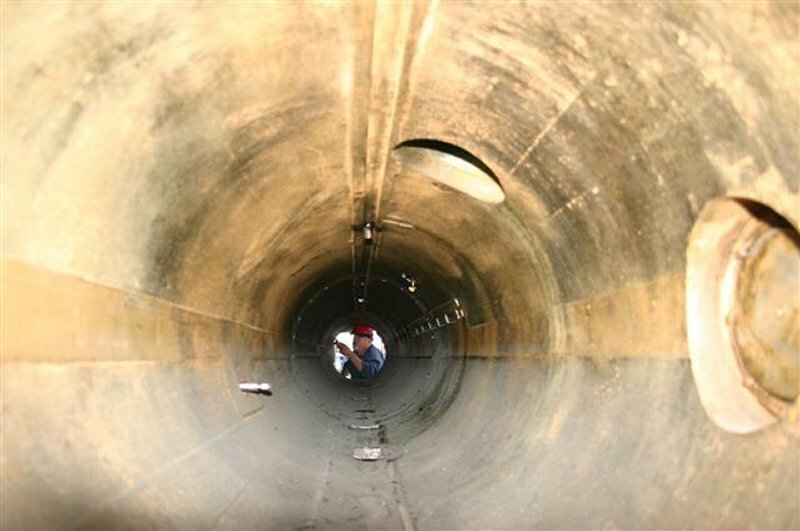 59k Looking through the business end of the Pampanito (SS-383) in drydock, February 2007. Courtesy of Jack Treutle (of blessed memory). 100k Page 1 of the Alameda California Journal, Volume 19, Number 111 for 9 February 2007 article on the Pampanito's (SS-383) drydocking, February 2007. Courtesy of Robert M. Cieri. 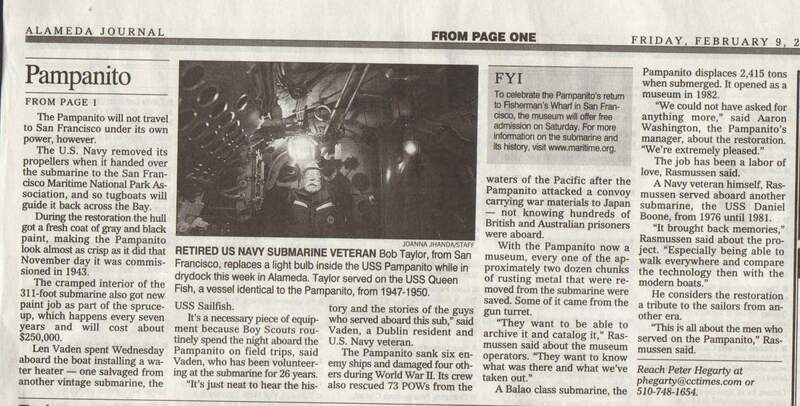 252k Page 2 of the Alameda California Journal, Volume 19, Number 111 for 9 February 2007 article on the Pampanito's (SS-383) drydocking, February 2007. Courtesy of Robert M. Cieri. 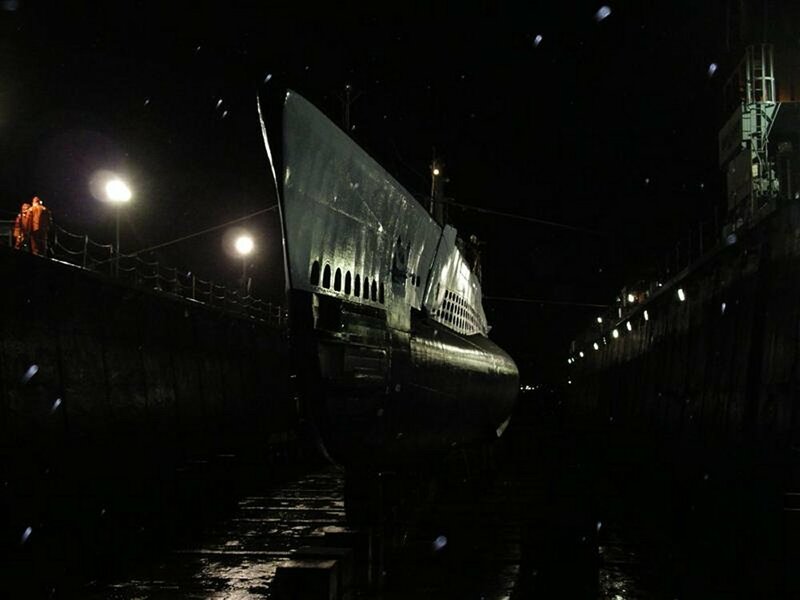 65k Wake up time for the Pampanito (SS-383) to return to Pier 45 starts at 4:00 AM as the boat is roused by the flooding of the drydock. Courtesy of Jack Treutle (of blessed memory). 27k Broadside view of the Pampanito (SS-383) on her way back home. Courtesy of Jack Treutle (of blessed memory). 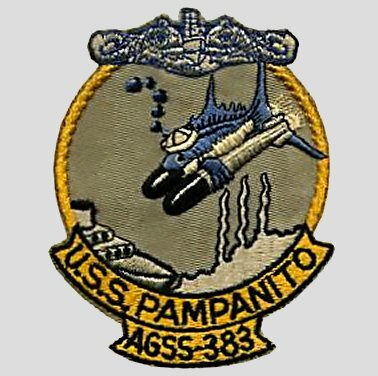 43k Pampanito (SS-383) returns home. Courtesy of Jack Treutle (of blessed memory). 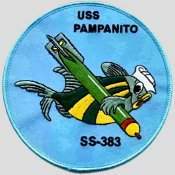 9.32k 27 images of the Pampanito (SS-383), 2014. Photos courtesy of Chris Edwards.